It's true. Back in my younger, slightly thinner days I had the unlikely job as a Santa Claus at Kaufmann's Department Store in downtown Pittsburgh, PA. In 1990 I had left my career as a counselor to delinquent teens and had been living on savings and the first few dribbles of a freelance writing and art career. I needed a job. At the time my friend Lori worked for Western Temporary Services (full-time, in their office, not as a Temp). At that time Western was one of the largest suppliers of Santa Claus “helpers” in the area. She knew I needed cash and genuinely thought that my demeanor would make me a good Santa Claus. She was right, on both counts. So, I attended Santa school to learn the intricacies of the profession. Reindeer names, that year's biggest toy hits, how to speak with children, how to deal with unruly kids and, in my experience, even unrulier adults. I earned my Santa diploma and was ready to deploy. I went through this routine for six years. Western handed out various assignments. We were needed at malls and private parties and various stores. While I did a number of different assignments over the years, due to my not having any kind of regular work schedule elsewhere I was assigned primarily to Kaufmann's during the weekdays. There were a couple of older guys who were longtime veterans of the Santa game (Earl and Al... Merry Christmas if you're out there), who were also Kaufmann's regulars. Kaufmann's provided our uniforms, one specifically for each of us so we didn't have to use each others. They were cleaned for us every week. 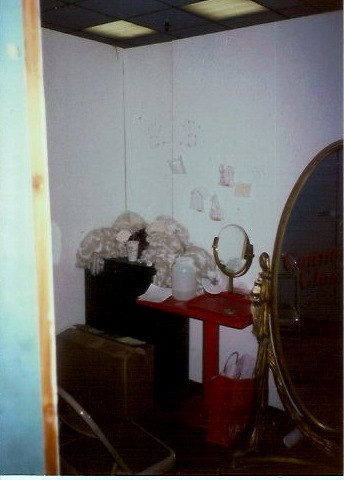 There was a backroom where these were kept that served as a changing room. 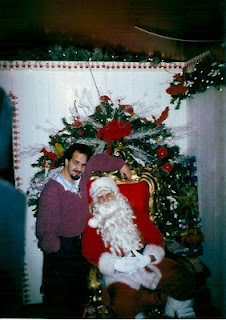 Though I have never been svelte, I was not really big enough to play Santa. I had a special pillow I used for my belly. Even with it some adults jokingly commented that Santa must have been on a diet that year. The Kaufmann's setup was great. Unlike the malls where Santa is out and on view at all times we had a small room with Santa's throne that was enclosed. Kids would line up outside in Santa Land where there were decorations and a TV playing kid's movies to keep them entertained while they waited. There were times when the line got really long. Schools would bring busloads in to see Santa. At other times, weekdays early in the season primarily, when things were really quiet. Over the years I worked with a number of great photographers and “Santa's Helpers” and though at the time we bonded over many of our experiences I'm sad to say at the moment I don't remember a single name (this was 20 years ago and I never saw any of them in any other context... some of them never saw me out of uniform). would remember her name. I don't. reestablished contact with this person. One of my Elves. She was there at least two years. Another one of the photographers. was a friend of the photographer's daughter. I saw hundreds of people over the years, maybe thousands, and had my picture taken with most of them. It's kind of weird to realize that even now, all this time later, my picture is in family photo albums all over southwestern Pennsylvania. Every Santa kind of looks alike, but I would know myself from the eyes. If you had your picture taken with Santa at Kaufmann's between 1990 and 1995 there's a pretty good chance that's my lap you're sitting on. In 1992 or '93 I received a phone call the night before the Pittsburgh Christmas Parade. The Santa they used every year had come down with the flu. They asked if I could fill in. So I drove down to the Civic Arena early the next morning, changed in my car and boarded the float. We trundled through downtown Pittsburgh and I waved at the throngs of people that lined the street. The positive energy being directed my way was amazing. At one point Pittsburgh sportscaster John Fedko climbed onto the float and told me we were going on live TV in two minutes. I had not been told to expect this. He asked me a couple of questions that I honestly don't remember, then asked me for a Holiday message to the world. No pressure, right? I riffed on the usual Peace and Good Will idea and ended by asking everybody to be kind to each other. Then Fedko thanked me, got off the float and we moved on. There were days in the long year in between Santa gigs when all I could remember was how uncomfortable the suit was, and to tell the truth as December rolled around I would find myself dreading going back. But the money was good... at least better than the other temp jobs I was doing at the time. I would enter the store on my first day and ride the narrow escalators up to Santa Land feeling a certain amount of trepidation and wondering what was wrong with my life. Probably not the best attitude for someone who was supposed to be bringing joy to children. I'm happy to say that the feeling passed quickly and I got into the spirit of things (though I admit to feeling some post-traumatic stress nerves every time I went into Kaufmann's for any reason for years afterward). 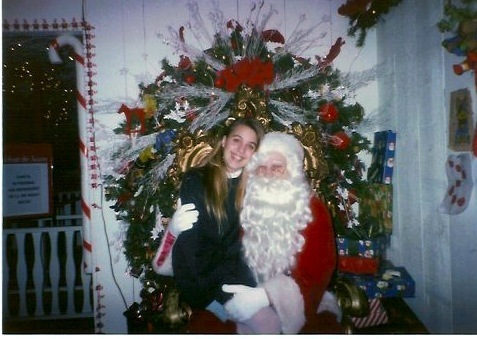 By all accounts I was a great Santa. 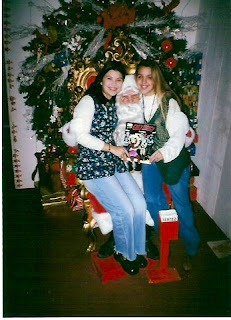 I was not the most bombastic Santa ever. My Ho-Ho-Ho's were more of a deep belly laugh rather than a loud (and frightening to some kids) exhortation. But I was kind to the children and listened to whatever they had to say. In the long run this approach allowed me to be more accessible and less frightening. Many of the experiences blur together, of course. I saw a lot of people. I'm happy to say that now my memories are mostly of the positive things. I remember a couple of obnoxious parents, but most of the kids were great. No one ever tried to pull off my beard. No one peed on me. There are of course some people and moments that stand out. There were a pair of sisters who had had their picture taken together with Santa every year since they were babies. They were, I believe, 21 and 17 the first year I saw them. Their annual picture was with me for at least five of the six years I was there. I hope they're still getting their picture taken with Santa. There was a little girl from, I'm assuming, a fairly wealthy family. She came in every year with her brand new leather jacket and boots that probably cost more than I made the whole Christmas season. There was the woman who brought her newborn in for his first Christmas picture with Santa. When I say newborn what I mean is, given the size of this baby I'm pretty sure she gave birth in the elevator on the way up. I literally held him in the palm of one hand. There was the little boy who was scared to death of Santa. His Mom brought him back every evening for an entire week. I didn't see him the first four nights. Another Santa was on duty. Apparently, the first night he didn't make it across the threshold of Santa Land, but Mom was kind and persistent and didn't push, and every night he got a little bit closer. On the fifth night, the first time I saw him, he came into Santa's sanctum. There was no one else around that night, so I talked to him calmly and before we knew it I was sitting on the floor playing with him with some of the toys we had there. 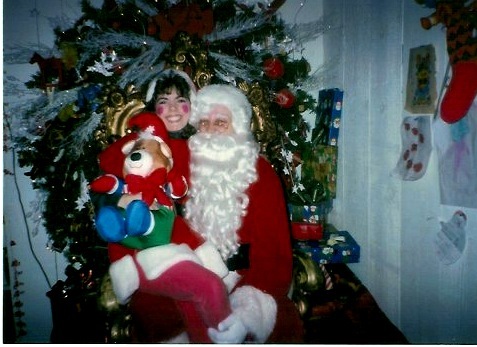 I heard Mom say to the photographer, “That's a different Santa tonight, isn't it?” Before they left that night we had taken the most joyous and happy picture of a kid on Santa's lap you could ever imagine. He's gotta be close to twenty by now. There was an older woman who came in one night. I'm making an assumption here, but I'm going to say she was mentally ill in some fashion. She came in and talked to me about the problems of the world and how sad that made her, and how thankful she was that Santa was there once a year to make things better. As she spoke I came to realize that she actually believed, at least in that moment, that Santa was real and that I was him. She came back the next night to give me a handwritten letter asking for all the things she believed the world needed from Santa. She may not have been well, but her wish list for the world was dead on. Dozens of scared kids, wringing their hands and twisting their Christmas clothes. Dozens of excited kids, talking really fast and shaking. A little girl who ran and jumped onto me, straddling my lap and facing me while talking a mile a minute. I hope wherever she is now she has found other moments in her life where she was as happy as she was right then. Some brought me gifts: candy or drawings they had made. Some were simply too shy to talk. My favorite anecdote of course is the one that involves my own godchildren. They are eighteen and sixteen now, but at the time Gabby was not quite three and Julian was ten months old. I had made plans with their mother, Dar, for us all to go get dinner after my shift. She brought them in right at the very end of the day. The idea was they could see Santa and then I could go change and meet them after. Dar brought Julian in and handed him to me. He was content. I think he probably recognized my scent and he was certainly used to me holding him at the time. Gabby, who has always been shy, got to the threshold of the room and stopped cold. She didn't cry, but she certainly wasn't coming any closer. I talked to her in my non-threatening Santa voice, but I couldn't convince her to come in. I can't do justice to her expression with words. She furrowed her brow and scrunched up her lips and looked at me through a curtain of blonde hair. Nothing could get her to move. Eventually we stopped trying. 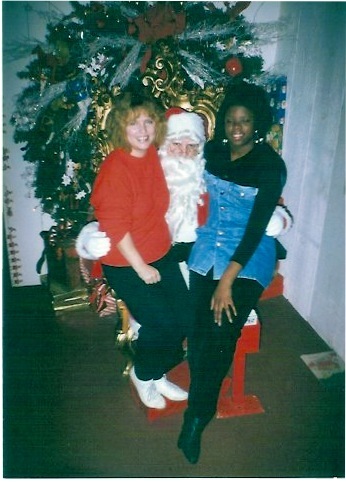 Neither Dar or I pressured her to do anything she didn't want to do, and she certainly wanted no part of Santa. My shift ended and Dar and the kids shopped around while I changed back into my street clothes. When I came back out into the shopping area Gabby saw me. Her eyes lit up. She yelled “Wayne!” and ran across the floor to jump up into my arms. “Guess what?” she chimed, really, really excited. My picture as Santa hung on their refrigerator every Christmas for years and as children neither of them ever recognized me. As they got older and their belief began to waver Dar took the picture down. She got it out again last year, which was the first time I told them this story. This is the refrigerator pic, a little worse for wear. Like a lot of people as we get older my enthusiasm for Christmas has waned. There's a lot of expectation for happiness that leads to disappointment. We're all busy and the extra shopping and extra money needed can be frustrating. I don't like the overblown commercialization and commodification that comes with the whole thing. The greed that leads to Black Friday style obnoxiousness really gets me down. Perhaps when people speak of peace and good will, they are asking to be given these. You asked us to take action. To be kind to one another. This was beautiful, Wayne. Thank you for sharing. I loved the captions you gave some of the pictures too. Wow. Great story. I'm sure you really stand out in a lot of kids Christmas memories, and that's something you can, and should, feel really good about. Every year, a tear jerker. I love you.